This is the last in my series of interviews about digital currencies for nonprofits. This is my interview with Erich of Spare Key. Spare Key helps Minnesota, North Dakota, South Dakota and Wisconsin families with housing grant assistance while their seriously ill or critically injured child is in the hospital. For 16 years, Spare Key has helped families “Bounce and not Break” with the gift of time. Read on to see what amazing things he is doing with the Dodge community. What are the risks for a nonprofit that wants to take Bitcoin? What are the benefits? It depends on your approach. For Spare Key, our goal is to receive Bitcoin in the same way we would accept cash dollar donations. We are not looking to sell commodities or invest the dollars. We take donor dollars and we plow them back into making rental and grant payments for families with critically ill or seriously injured children in the hospital. The risk is when you make the decision to hold onto Bitcoin as some form of investment as a non-profit. Bad idea. Or, if you decide you are going to conduct commercial transactions such as selling t-shirts and coffee cups and the like as a fundraiser. If you purchased a cup for $5 with the intention of selling it for $10 and accepting Bitcoin as a form of payment — you have to be cognizant of the fact that if you received the $10 value in Bitcoin at 10:00 in the morning, by the time you convert that into cash at the end of the day it may have a value less than the original $5 you paid for the cup. The benefits are, endless. By being an early adopter we’ve made it clear that we bullish on all things crypto currency. We are reaching new audience segments that are not traditional donors. They, in turn, are raising our profile and awareness with their networks and turning them onto our mission and program. The infrastructure for doing this is essentially, at this stage, sweat equity. That’s a pretty good ROI for something that a small non-profit like Spare Key can embrace. With the IRS ruling that Bitcoin is not a currency, should nonprofits be scared to deal with it at all? Ask me that question when we start getting enough $50,000 USD in Bitcoin! For Spare Key, and other non-profits, I am not sure that this is the issue to be worried about at this point in time. When we start seeing a significant inflow of Bitcoin we will actively consult with our tax advisor to make sure that we’re properly accounting for what we receive and offering the appropriate guidance to donors that wish to support us in that way. How would a nonprofit even approach to start taking Bitcoin for donations? Who would they hire to enable it with their current systems? I am nearly 51 years old and have the technological skill of a newborn baby. Accepting Bitcoin is as easy as accepting cash. We didn’t have to hire anyone to set it up. At the outset we simply set up an account with BitPay. Embeded their link to our website which is WordPress. And, began accepting Bitcoin which was then converted to USD and transferred to our Bank Account. Easy in, Easy out. All this being said, I know what I don’t know and taking our efforts to the next level is important. That is why we hired what we believe to be the first ever Director of Crypto Currency Development. Roerick Sweeney is my eyes and ears on this initiative and he understands the ins and outs in a way that would confuse me and distract us from our core efforts in this way. It also sends a signal that Spare Key is serious about being involved in the crypto currency economy. He knows the community well and understands what they place value in, and he understands the technological issues inside and out. If a nonprofit wanted to experiment with taking dodgecoin, how would they start? Events? Galas? Mobile campaign? I would say that non-profits should engage with it the same way they would cash money. We accepted Bitcoin at our annual gala, The Groove on March 1st. Find an event. Stage an action. And, to steal a corporate America slogan: Just Do It! How long before we see wide acceptance (in small to mid-size nonprofits) of Bitcoin or other digital currencies? I think the “Golden Ticket” is whether the transaction circle can be completed and that’s Phase Two of our efforts in this arenea. If we can not only accept Bitcoin and other crypto currency, but then make rental and mortgage grants on behalf of families we serve in that same currency form to banks and rental companies, we will have expanded the crypto currency economy exponentially. If the most conservative agents of our economy — banks, financial and lending institutions — can find their comfort level in accepting and engaging in transactions with digital currency then it will go a long way towards achieving wide acceptance. 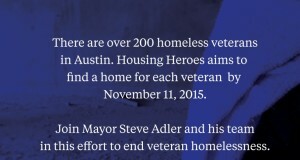 How to solve for Homelessness in Austin. Innovation at it’s Best. Don’t Sell….but Sell. Don’t Ask….but Ask.